DOJ's Big Bank Settlements Remove Potential Conflict Of Interest For Trump : The Two-Way Regulators reached a $7.2 billion deal with Deutsche Bank over toxic mortgage securities. President-elect Donald Trump owes the bank hundreds of millions. Credit Suisse agreed to pay $5.3 billion. A view of Deutsche Bank's corporate headquarters in Frankfurt, Germany. In the last days of the Obama administration, the federal government has reached multibillion-dollar settlements with Deutsche Bank and Credit Suisse over their sale of toxic mortgage securities. President-elect Donald Trump owes Deutsche Bank hundreds of millions of dollars in loans. So that deal removes a potential conflict of interest — where a Trump Justice Department would have been negotiating the settlement. 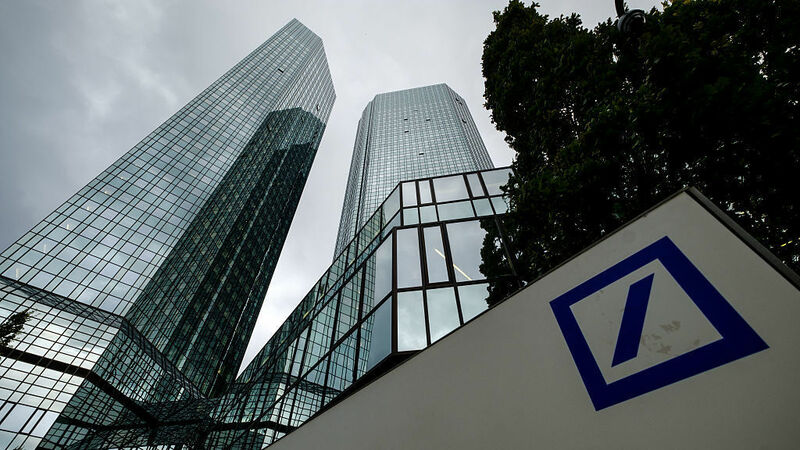 Deutsche Bank settled for $7.2 billion, while Credit Suisse agreed to pay $5.3 billion. The deals resolve U.S. investigations into the sale of toxic securities tied to mortgages in the run-up to the financial crisis. Regulators have already struck similar deals with major U.S. banks. A third European bank, Barclays, resisted a settlement offer and is now being sued by the Justice Department. Most of these cases involved the banks' so-called securitization of home loans. That is — the banks would pool thousands of individual home loans and bundle them into a security, of which the bank could then sell shares to investors. The problem was that in many cases, the banks were telling investors and ratings agencies that these loans were much more likely to be repaid than they actually were. The time frame dates to the crazy days of the housing bubble, when lenders were making loans to homebuyers with no proof of income and the terms and interest rates on many of the mortgages made them impossible for homeowners to repay over time. It was this packaging of largely garbage loans — and telling investors they were safe and solid investments — that was at the heart of the financial crisis. Many investors suffered massive losses. Entire financial institutions collapsed or required government bailouts to survive. So in effect, these settlements are an effort to make the major banks involved pay a penalty for helping to crash the global financial system and for sending they U.S. economy into recession. The multibillion-dollar bank settlements at least sound like pretty stiff penalties. "They're very substantial," says Harvard Law School professor Hal Scott. But he adds, "In the case of Deutsche [Bank], at least we know it's roughly half of what the Justice Department was seeking initially." Scott says it's puzzling to him how these sums get arrived at. He's an expert on international financial systems. He says the Justice Department's methodology for the penalties in these mega-bank-settlements isn't public: "We don't know exactly how they do that." "If I were doing this I would start by trying to determine you know how much did people lose as a result of these activities," Scott says. "That would be a starting point." So he says greater transparency into questions and calculations like that would give these settlements greater credibility.